I am neither in favour or opposed to the Wheat Board. In fact, I have long contested that farmers should decide the Board's fate. However, let's be honest on the matter. If one is going to solicit opinion on something as important and potentially controversial it is a simple YES or NO question, not this mess. If separatists in Quebec attempted a question like this, most rationale thinkers would scream. If this question showed up on an exam, there would mild confusion, since you may want to answer more than one. The Conservatives should ask the question straight up. The inclusion of a third option is brilliant if you want to split the vote, but does nothing to improve legitimacy. # posted by Shaky @ 11:21 p.m.
1. Retain the single desk. 2. Market to CWB or others. The third question seems to have been added for CPC's Alberta base, who weren't particularly fond of it. # posted by Prairie Boy : 12:17 p.m.
2. The CWB is no longer involved in any way in the sale of barley and farmers can operate on the open market. # posted by Soutie : 2:29 p.m.
You're right; it should have been a plebicite regarding the very existence of the Wheat Board. Without the single desk, the CWB is an illegitimate monopoly which would not be able to survive legal challenges through NAFTA or the WTO. 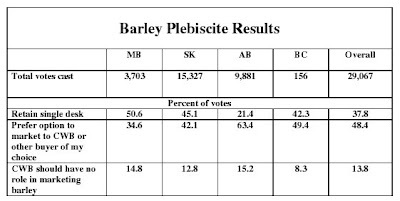 The barley plebicite was an interesting poll, to be sure, but when the Conservatives bring forth the wheat question, the answers they get might be significantly different. Especially if the question itself is considerably clearer. # posted by Rob Huck : 2:32 p.m.